Rendering of the orbit of the newfound dwarf planet RR245 (orange line), which scientists say is the 18th largest object in the Kuiper Belt beyond Neptune. Pluto isn't quite as lonely as scientists had thought. Astronomers have discovered another dwarf planet in the Kuiper Belt, the ring of icy objects beyond Neptune. But this newfound world, dubbed 2015 RR245, is much more distant than Pluto, orbiting the sun once every 700 Earth years, scientists said. (Pluto completes one lap around the sun every 248 Earth years.) You can see an animation of the new dwarf planet's orbit here. "But almost all of these icy worlds are painfully small and faint; it's really exciting to find one that's large and bright enough that we can study it in detail," Bannister added. The exact size of 2015 RR245 is not yet known, but the researchers think it's about 435 miles (700 kilometers) wide. Pluto is the largest resident of the Kuiper Belt, with a diameter of 1,474 miles (2,371 km). The research team first spotted 2015 RR245 in February of this year, while poring over images that the Canada-France-Hawaii Telescope in Hawaii took in September 2015 as part of the ongoing Outer Solar System Origins Survey (OSSOS). "There it was on the screen — this dot of light moving so slowly that it had to be at least twice as far as Neptune from the sun," Bannister said. 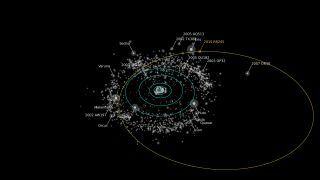 OSSOS has discovered more than 500 objects beyond Neptune's orbit, but 2015 RR245 is the first dwarf planet that the survey has found, the scientists said. Discovery images of the dwarf planet RR245, showing the object’s slow motion across the sky over three hours. Dwarf planets are massive enough to be crushed into spheres by their own gravity, but they have not "cleared their neighborhood" of other objects, which differentiates them from "normal" planets such as Earth and Saturn. This definition, which was devised by the International Astronomical Union in 2006, led to Pluto's controversial reclassification as a dwarf planet. 2015 RR245 — which will get a catchier, official name at some point — will make its closest approach to the sun in 2096, the researchers said. Other confirmed dwarf planets in the Kuiper Belt region include Pluto, Eris, Haumea and Makemake. Several other objects in this distant realm, including Sedna, Quaoar and 2007 OR10, probably meet the dwarf-planet criteria as well, scientists have said.